A black and white portrait photograph of John Ball Dow (1851-1910). John Ball Dow was born at Glen Dhu farm, lot 23, concession 3, Whitby Township, on November 29, 1851. A graduate in law from Queen's University in Kingston, Ontario in 1875, he was a lawyer in Whitby until 1907 when he was appointed Clerk of the Ontario County Court and Registrar of the High Court and Surrogate Court. 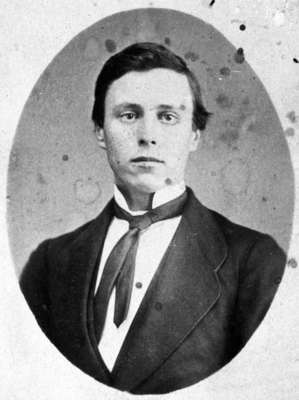 A member of the Whitby Board of School Trustees for many years, Mr. Dow was one of the founders of the Provincial Trustees' Association in 1886. He was the association's first secretary, and later its president. In 1905 he was elected President of the Ontario Educational Association, and organized the Provincial Educational Advisory Board. He was one of the leaders of the St. Andrew's Society in Whitby and Pickering. Mr. Dow died at Whitby on March 1, 1910, and is buried at Union Cemetery, Oshawa. John Ball Dow, c.1869, R.H. Wilson. Whitby Archives 31-009-164.